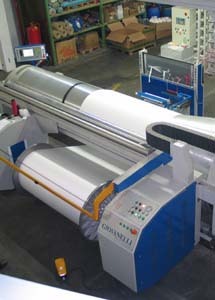 Warping is performed by two machines, one of which is able to prepare warps up to 3.6 m. and 1000 mm in diameter, with an automatic control of the entire process and constant reproducibility of the product type. 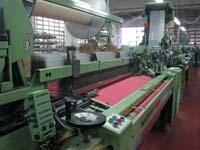 Weaving is performed by the latest generation of heddle machines that guarantee the maximum production flexibility, with the possibility of interweaving written selvages that are controlled by electronic jacquardine, this meaning absolute precision and product quality. Working with a double beam is also possible. The maximum height of the weave is 200 cm. 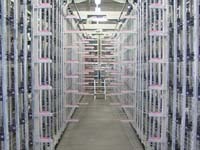 Additional processing such as mending of unfinished fabrics and warping preparation guarantees a comprehensive service.